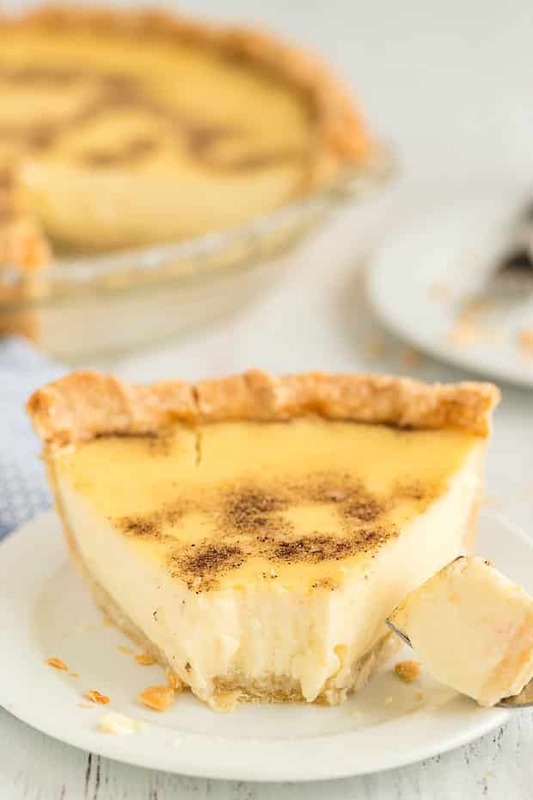 Custard pie is an old fashioned, southern dessert that people have been making for nearly 200 years. 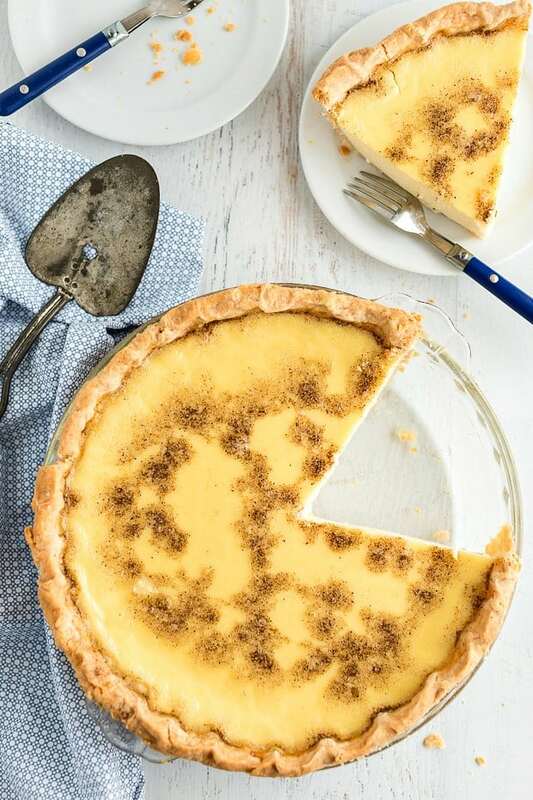 With eggs and milk being the main ingredient to make a custard filling – and nutmeg sprinkled on top – this pie is smooth, silky and ridiculously rich. It’s always a big hit at my house. 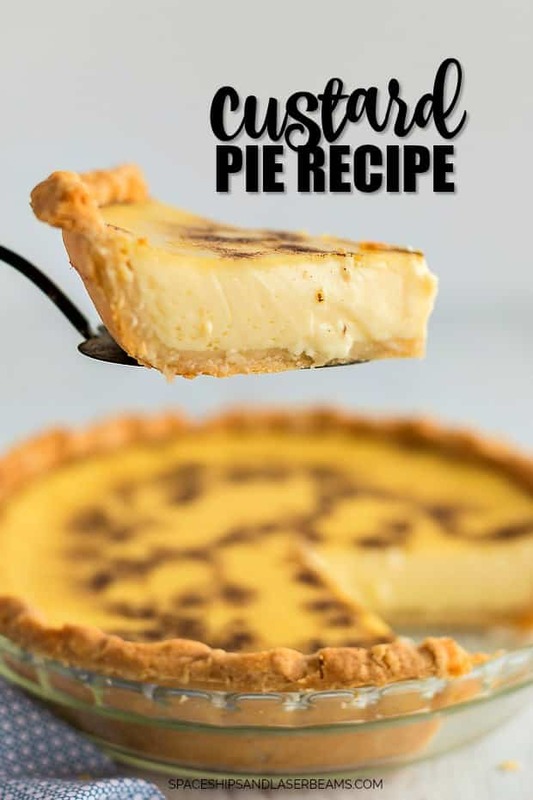 For more delicious pie recipes, check out our jello pie, peanut butter pie, and chocolate pudding pie. Our banana pudding pie is also very popular! Recently I have been feeling quite nostalgic with my baking. I want to make the kind of traditional desserts your grandma used to make from scratch with good old flour, sugar, butter, and eggs. 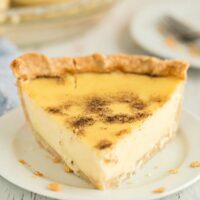 Custard pie brings back instant good memories. It’s an oldie, but a goodie! This recipe is really simple to make but it tastes like you’ve been slaving away in the kitchen for hours! (Shh, don’t tell anyone!) Last week I was able to throw this dessert together at the last minute when we had some unexpected dinner guests. They loved it so much, they even asked me for the recipe. I’ve seen some recipes made with evaporated milk. This makes the custard filling even richer. Feel free to substitute this for regular milk if you like your custard extra creamy and sweet. 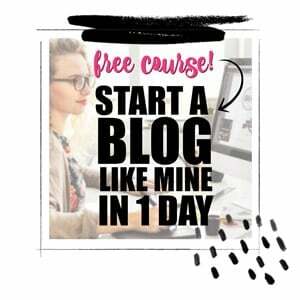 This recipe is super simple, it’s just an easy dump and stir process. Grab your ingredients and measure out the sugar, vanilla, and milk. Preheat your oven to 350 degrees. 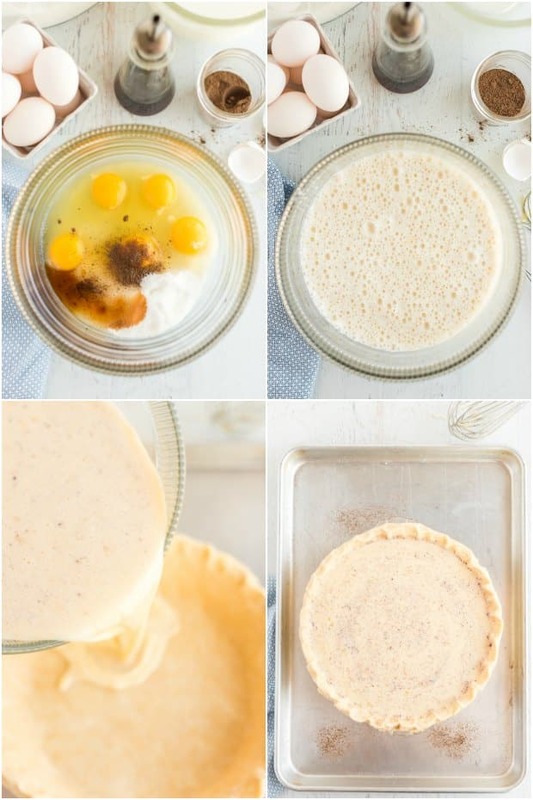 Get your unbaked pie crust in a pie and press the edges to the sides of the pie pan. Pour the custard pie filling into the unbaked pie crust. Sprinkle the top of the pie generously with nutmeg. Pop the pie in the oven for 45 minutes or until set. You’ll be able to tell when it’s done by doing a simple jiggle test. Try gently shaking the pie pan and if the center of the pie jiggles slightly, it’s done! Can You Freeze a Custard Pie? This classic recipe is ridiculously silky and creamy when it is freshly baked, but unfortunately, it is not one of those desserts you can freeze, defrost and enjoy later. As with most dishes that contain dairy, when it is defrosted, the ingredients separate and you lose that rich silky goodness that makes this recipe to die for! If you have leftovers, the pie will stay fresh in the refrigerator for 2-3 days. At my house, this recipe never lasts more than 2 days! I love baking and finding new recipes to try but sometimes there’s nothing better than making an old favorite traditional recipe for the ones you love. I hope you and your family enjoy it too. This old-fashioned, classic Southern treat will leave your taste buds begging for seconds! Beat together sugar, eggs, nutmeg, and vanilla then add milk. Bake at 350 degrees for 45 minutes or until set. You can make two 9-inch pies with this amount of filling, baking for 45 minutes to 1 hour. Or you can use one 10-inch pie pan as pictured with this filling, baking for 90 minutes. This is a delicious favorite for us – we love it!